Pretty Kitty Clear-Mount Stamp Set by Stampin' Up! Nothing brightens a day like the snuggles and purring of a pretty kitty. 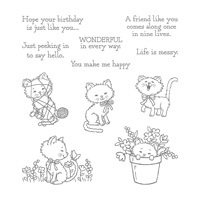 Cheer up someone’s day with the adorable stamp set.